E. 102nd St. and 5th Ave.
Media outlets may have forgotten about Haiti, but we haven't. As climate change intensifies, island countries like Haiti suffer its worst effects — despite its people being least responsible for these changes. 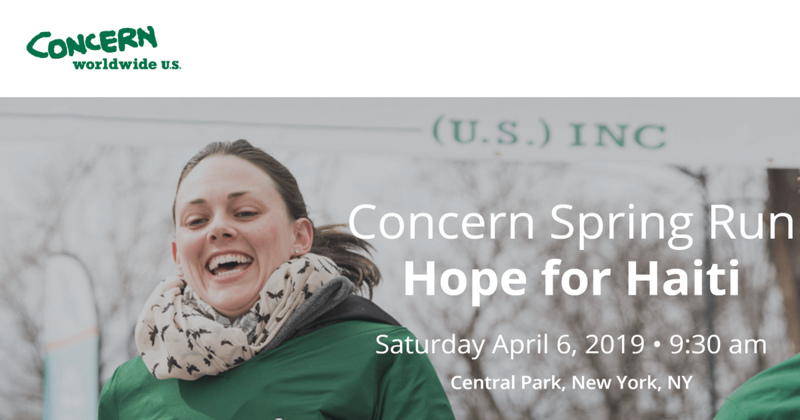 On Saturday, April 6, join our compassionate community of 800+ runners, walkers, and supporters who aim to fully fund a Concern resiliency program in Cité Soleil, Haiti. The first $100K raised will provide flood and disease prevention for 83,000 people living in what's often called the “worst slum in the Western Hemisphere.” All additional proceeds will support Concern countries that need it most. Start 2019 on the right foot — with hope, determination, and a 4-mile run/walk. We can't wait to see you, your friends, and your family in Central Park this April. Central Park The start line and bib pickup will be located inside the 102nd Street entrance of Central Park, near the North Meadow Softball Field (#8).